Threats to national security: use of crime, violence and deliberately-planned economic warfare (total cost $4.1B) to achieve political/criminal objectives by native militants and organized crime groups – supported by radical anti-capitalists, anarchists, unionists, anti-Israel groups, and supporters of terror organizations. a. Why did Canadian citizens need a peacekeeping mission? b. Did the Ontario government have the authority to authorize a peacekeeping mission on Canadian soil? Would the deployment of peacekeepers on Canadian soil not require the approval of the federal government? c. Did the Ontario government or the OPP have the authority to suspend the protections of the Charter and Ontario’s Police Services Act and replace them with a peacekeeping mission? d. How could the Ipperwash Inquiry endorse the concept of ‘peacekeeping’ or provide any useful recommendations to address the violence and destruction in Caledonia given that it did not study the issue of preventing native violence against innocents? (In fact, the inquiry actively worked to suppress evidence from residents). The intentional exclusion of non-native residents and their evidence is why this vital issue is not specifically addressed in any of the Inquiry’s 100 recommendations. The use of the Ipperwash Inquiry to ‘justify’ the government/OPP’s handling of Caledonia is policy fraud of the highest order in the face of overwhelming evidence of its deleterious effects. Federal obligation to defend the Charter: What obligation does the federal government have, or should it have, to step in when a province effectively suspends the Charter of Rights and Police Services Act protections for an entire class of citizens? Potential for poor/fraudulent policy-making due to other ‘legalized’ myths such as ficticious land claims; Colour of Right; Duty to Consult; Aboriginal Rights trumping Canadian law, etc. Political interference in policing: government use of police to target non-native activists; promises by Minister of Community Safety & Correctional Services to extremists not to call in military to protect Caledonia citizens. Duty of police officers to disobey illegal orders. How is it that so many officers felt what they were doing was wrong, yet continued to obey orders they knew were likely illegal? Human Rights protections for non-minorities. Media culpabilty in making Caledonia possible: racism towards non-native victims; failure/refusal to conduct investigative journalism; role in spreading police propaganda vs. non-native activists without questioning facts or motives. NGO refusal to aid non-native victims – i.e. the Canadian Civil Liberties Association ignored our numerous requests for a meeting with Caledonia residents to discuss the systemic violations of civil rights. Failure of religious leaders to speak out against injustices. Why were church leaders silent as the injustices mounted? Failure of legal community to speak out; refusal to aid non-native activists (with several notable exceptions). Funding of native extremists by governments vs. lack of funding for rule of law activists. Property rights in face of police abdication: future of mortgage security/land title protection under OPP regime whose stated position (confirmed under oath by former Commissioner Fantino) that the force is justified in not protecting non-native property owners because Land Title deeds are not sufficient proof of ownership during a land claim dispute. Academic freedom vs. campus intimidation. Lack of rigorous academic scrutiny; importance of updating educational curriculum to include Caledonia and rule of law studies. 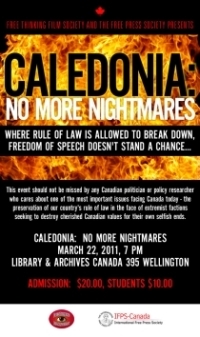 Lack of governmental ‘safety valves’ for victims of systemic refusal by provinces/police to enforce the law: if another Caledonia happened today, what government agency – federal or provincial – could victims and activists turn to, given that every level of government and every agency responsible for protecting them had abandoned them? Nexus between police and government appeasement of native extremists in and outside the courts and the ‘dhimmitude’ shown in the face of Islamic extremism. Not only were police refusing to enforce the law vs. native militants in Caledonia/Haldimand County, Ontario government lawyers actively worked (unsuccessfully) to convince the court this refusal had a basis in law. They opposed every attempt by non-native activists to lay charges via private prosecutions against the militants whom the ‘dhimmi’ police had actively protected in the first place. They opposed charges against ‘dhimmi’ police officers themselves who were videotaped as they helped native occupiers build a fence to keep the lawful owner out of his Hagersville development property. When charges sought by us (Gary McHale and Jeff Parkinson) via the private prosecution process were certified by judges despite steadfast opposition from Crown lawyers (non-lawyer McHale took on 3 government lawyers to successfully convince a Superior Court judge to issue process for the charge of Influencing Muncipal Official vs. Julian Fantino), they were dropped by the Crown as soon as possible afterwards. Lawyers for the OPP told the Ontario Human Rights Commission the reason they prevented non-natives from raising Canadian flags in Caledonia (4 of whom were arrested for this ‘crime’) was out of concern that an “extreme element” might want to “harm” us. It was simply easier for police to give into the demands of violent militants than to protect the rights of the innocent to walk down a street and place a Canadian flag on a public utility pole across the street from the site of an illegal occupation. These are frightening examples of the ‘dhimmitude’ philosophy of appeasement in action in a non-Islamic context. Policy researchers and makers must come to understand that the same appeasement mentality which allowed the rights of Caledonians to be subjugated to the will of native extremists is the same attitude which will one day allow Sharia Law to enter our country simply because it will be easier and more politically expedient to do so than confronting those who advocate on its behalf with escalating levels of intimidation. Unintended victimization of natives by racial policing policies intended to appease native extremists. When one reads Helpless however, one realizes it is ‘simply’ an account of ‘what happened’ and not a solutions/root causes/policy development book. This is not a criticism in the slightest because Blatchford never intended the book to be any more than this. Helpless is just the beginning, a base or jumping off point that makes possible, at long last, a discussion of the issues, causes (real or imagined) and solutions that will give the ignored victims of land claim lawlessness – both native and non-native – a permanent seat at the policy development table for the first time in Canadian history. What Helpless does do (without ever claiming to do so) is to dramatize for policy developers that victims and potential victims of flawed aboriginal policies are stakeholders who can no longer be ignored and wilfully suppressed if Canada is move towards meaningful healing and reconciliation based on truth, justice and respect for all human beings instead of the dead end offered by the lies, injustices, intimidation, violence and appeasement of extremism of the past in places like Caledonia, and Ipperwash before it. This, of course, was always our ultimate goal in opposing and documenting what happened to the victims: realistic policy-making to ensure there are no more Caledonias. Unfortunately, despite the enormous attention brought to bear on the Caledonia crisis by us and by Helpless, the Ontario Provincial Police, Ontario government and Six Nations have yet to admit wrongdoing, let alone apologize for what they allowed to happen to the innocent people of Haldimand County. As incredible as it may seem, as of Dec 10/10 the present commander of the OPP’s Haldimand detachment has not read Helpless nor would he accept a copy offered by us. This same officer declared to us, during a pre-Helpless meeting, that there was no two tier justice in Haldimand County. We regard the terrible things which were allowed to happen in Caledonia and Haldimand County to innocents as ’Crimes Against Democracy,’ and, while we do not wish to overstate the matter, we believe that one day, when the full depth of the psychological, physical, and economic costs are tallied against the utter lack of lawful justifications for them, some future researcher might well make the argument that the actions of the Ontario Provincial Police and the Dalton McGuinty government in subverting the Charter of Rights and Ontario’s Police Services Act under guise of an illegal peacekeeping mission on Canadian soil could be legitimately be called a Crime Against Humanity. There can be no more Caledonias, no more crimes against democracy. If there was ever a time for good policy-making and rigorous academic scrutiny to trump politics it is now. The material cited in our Post-Helpless Reading List will give you a good introduction to some of the vital issues listed above as well as a sense of the enormity of the exciting and potentially-rewarding project ahead of us. NOTE: If you are a bonafide researcher or journalist who has read Helpless and reviewed the material in our post-Helpless Reading List please feel free to contact us with questions or inquiries about additional evidence or supporting material.